Theo Fabergé, the last grandson of Russian Imperial Jeweller Carl Fabergé, created the 60TH ANNIVERSARY TROPHY to celebrate the sixty years which have passed since the creation of the modern state of Israel. Since the 1990s Theo always wanted to travel to Israel and had wanted to design an Egg for Israel. He had chosen the Menorah outside the Knesset building as the ‘surprise’. In fact he had personally made a beautiful menorah in 1987 using diverse materials including gold, pink ivory, mammoth ivory and ebony wood. Theo chose guilloché enamel, rare woods and precious metal for the 60TH ANNIVERSARY TROPHY. 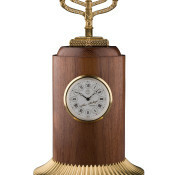 The Trophy is posed on a base of ornamentally turned silver and gold, crafted on Theo’s own Holtzappfel lathe dating from 1861.The support is hand-turned in bubinga wood selected from renewable plantations in central Africa, and bears a clock whose face is embellished with Theo’s own signature. The finial is the Menorah as designed by Benno Elkan and presented by the British Parliament to stand in front of the Knesset. The Menorah is decorated with 18 brilliant-cut diamonds, and offset with 7 faceted rubies representing the light of the candles. 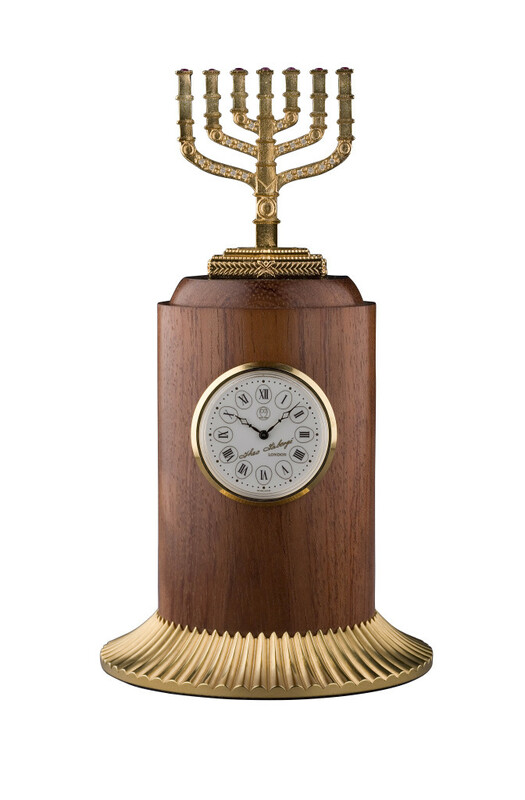 Theo Fabergé’s 60TH ANNIVERSARY TROPHY is an eloquent testimony to the world’s applause for the endurance of the State of Israel, and its fine craftsmanship and exquisite design bear witness to mankind’s lasting aspiration for beauty and truth. Materials: Sterling silver and 24 carat gold, bubunga wood and faceted rubies.